It's IntLawGrrls' immense honor this week to welcome Patricia M. Wald (left) as a guest blogger. Pat, about whom we've frequently posted, served from 1999-2001 as a judge on the International Criminal Tribunal for the former Yugoslavia, succeeding Gabrielle Kirk McDonald. Before joining ICTY Pat had served from 1986-1991 as Chief Judge of the U.S. Court of Appeals for the District of Columbia Circuit, part of a judicial tenure there that spanned 20 years. She was the court's 1st woman chief. Service on an ad hoc tribunal was but one of many positions touching on international law and foreign policy. Last year she co-chaired the American Society of International Law's International Criminal Court Task Force, which recommended renewed U.S. engagement with the ICC. Among many other things, Pat also: served on the Open Society Institute's Justice Initiative Board; was a member from 2004 to 2005 of the President’s Commission on the Intelligence Capabilities of the U.S. Regarding Weapons of Mass Destruction; and served from 1994 to 1999 on the Executive Board of CEELI, the American Bar Association's Central European and Eurasian Law Initiative. Before becoming a judge, she'd been, again among many other things: the Assistant Attorney General for Legislative Affairs at the U.S. Department of Justice; co-director of the Ford Foundation Drug Abuse Research Project; and an attorney with the Mental Health Law Project, the Center for Law and Social Policy, the Neighborhood Legal Services Program, and DOJ's Office of Criminal Justice. Having earned her J.D. from Yale and her B.A. 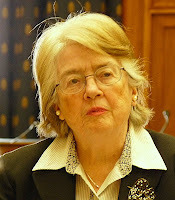 from the Connecticut College for Women, Pat clerked for Judge Jerome Frank, U.S. Court of Appeals for the Second Circuit. She's published many articles on international criminal justice, as well as five books on criminal justice, children's rights, poverty, and women. As IntLawGrrls' guest blogger, Pat contributes 3 posts excerpted from her recent presentation at the 3d Annual International Humanitarian Law Dialogs in Chautauqua, New York, an event for which, as we've posted, IntLawGrrls was a proud cosponsor. (In this she joins guest/alumna Judge Marilyn J. Kaman.) In her 1st guest post, below, Pat gives recognition to women leaders in international criminal law and explains why she believes that women judges make a difference. Tomorrow's 2d post will discuss the attention due in tribunals to the needs of women and children; Wednesday's 3d post, how crimes against humanity doctrine might be used to protect women from state-tolerated regimes of oppression, in peacetime as well as in the context of armed conflict. Her full presentation will be published by ASIL, as have been the Proceedings of the 1st and 2d Dialogs. a wonderful German/Jewish woman, Gisela Konopka, who fought in prewar Germany for children's rights, was put in a concentration camp, managed to get out and work her way through occupied Europe to America, where she became the champion of children, especially girls, who got in trouble with the law. Konopka (right), who appeared as "a prime expert witness" in a class action that Pat litigated against the Texas Youth Authority in the early 1970s, was from 1947 to 1978 a professor of social work at the University of Minnesota, where the Konopka Institute on adolescent health and medicine was named in her honor. Her publications are listed here. Konopka died at age 93 in 2003. She inspired me as to what an older woman can do right up to the point of departure to help those behind. Konopka joins other foremothers in the list just below our "visiting from..." map at right.